Your motorcycle’s gas tank is an important part of the bike – for both operation and appearance. Gas tanks are typically made out of steel, fiberglass, or plastic. Steel gas tanks are the most common. Unfortunately, most steel gas tanks on old motorcycles have been stored improperly. You’re likely to find some rust on the inside of the tank when you pick up a project bike. Cleaning out and protecting the inside of the tank is an important part of your rebuild. Empty the tank, shake around some loose bolts and nuts, and rinse with gas or acetone. Use the electrolytic rust removal method. Rinse the tank and seal it with RedKote or a similar tank sealant. If there are too many pinholes or major damage to the tank, you’ll either need to get it welded or just replace the tank all together. 3 Position Petcocks: 3-Position Fuel Petcocks have a On, Off, and Reserve position. The On position is for normal operation and draws fuel from the top of the tank. The RES position is used for when the fuel level gets too low, and it draws fuel from lower in the tank. Vacuum Petcocks: Vacuum On/Off petcocks typically have 3 positions as well – On, Reserve, and Prime. On is normal operation and allows the vacuum diaphragm in the petcock to feed fuel into the carbs. The Reserve position is for when fuel levels are low. 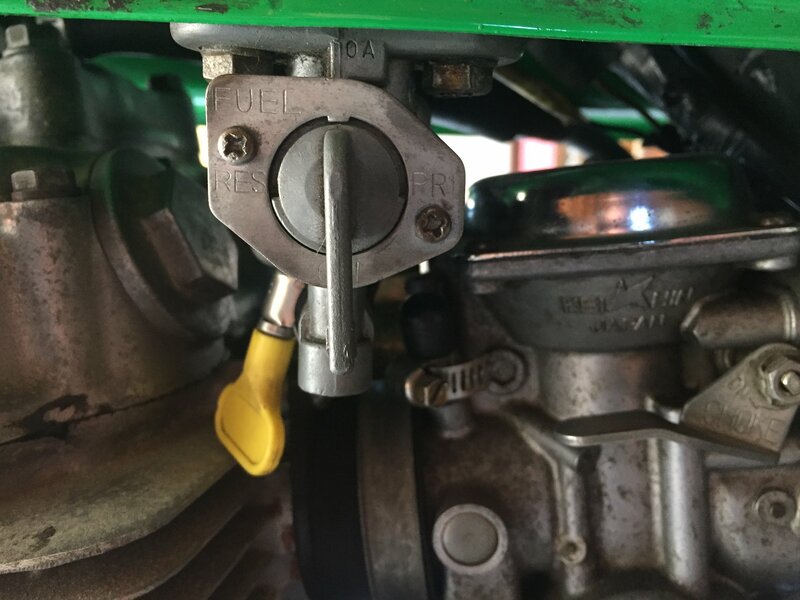 The Prime position bypasses the diaphragm to allow the carbs to fill with fuel when you are just starting up the bike. On/Off Petcock: These types of petcocks simply have two positions – one allows fuel to flow, the other does not. Many petcocks have built in filters that prevent particles from reaching the carbs. You can also add an inline filter to your fuel line. If your motorcycle’s fuel petcock is not working – either fuel won’t flow or won’t stop flowing – you’ll need to repair or replace it. You can often purchased a new or used working petcock and replace it entirely, or you can purchase repair parts. Loosen the mounting bolts that secure the petcock. Loosen the small screws on the front and back of the petcock to expose its internals. Clean the petcock with carb cleaner, wiping away any gunk and varnish. Replace any o-rings and rubber parts.